The two simple German syllables 'MACHT NICHTS' appear on the screen. When reading them closely, an ambiguity of meaning shines through. A stunning German wordplay unfolds, a double meaning, which is staggering but hard to translate: on the one hand 'MACHT NICHTS' could mean 'it does not matter, it’s not so bad', on the other hand it could be the imperative 'don’t do anything' or 'do nothing'. However, these words could also just be the nouns 'power' (Macht) and 'nothing' (Nichts). The absence of a sender makes the message’s ambiguity uncanny and thought-provoking: am I being told to take it easy or told to remain passive? A reversal of advertising strategies seems to be at play: are we being instructed not to do anything? To stand still and not to fulfill the claims of advertisement - to work, shop and consume? Is this comforting? Does it matter, if we don’t do anything? 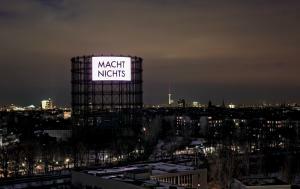 Clemens Wilhelm’s 'MACHT NICHTS' interrupted the advertisements on Berlin’s Gasometer Nightscreen for one night in February 2010. The work now returns for the Media Facades Festival. Clemens Wilhelm is a multi media artist. He combines photography, video and performance in his projects, which are often collaborations with audiences. Public space is his hunting ground - on the street, in the gallery or in the net. His work revolves around concepts of individuality and the individual’s interactions with society: the development, representation and expression of the self. Another focus is the creation of meaning through language. He studied Fine Arts, Philosophy and English and was awarded 'Meisterschüler of Prof. Candice Breitz' at HBK Braunschweig in 2009. This was followed by a one-year-residency grant by KSN Northeim, Niedersachsen.